The company is honored to have received multiple awards for industry marketing excellence. The Community Spirit award for our leadership in the 2018 St. Jude Dream Home campaign is especially meaningful due to the team effort of so many generous partners required to make the campaign a success." 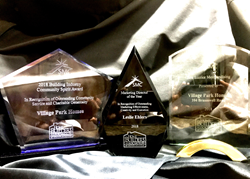 Village Park Homes, a Bluffton, SC based homebuilder and residential developer, today announced that it received multiple industry awards for homebuilding marketing excellence at the 2018 Summit Awards held in Savannah, GA on April 10th, 2019. Village Park Homes received the honors based on the cumulative efforts of a dynamic team of industry professionals that have catapulted the company’s success as a regional homebuilding force to be recognized. Village Park Homes received honors for Best Interior Merchandising for the Pinehurst model at 104 Bramswell Rd in Westbrook Grove at Savannah Quarters. The home was staged by Bluffton based design firm, Timeless Interiors. 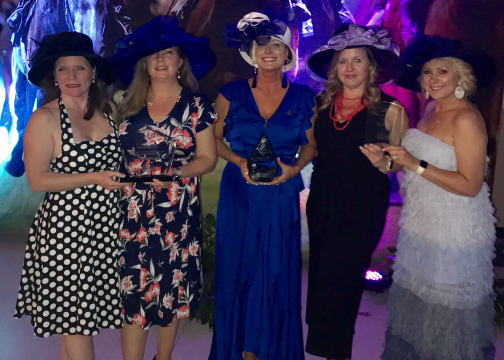 Village Park Homes’ Director of Marketing, Leslie Ehlers, was awarded 2018 Marketing Director of the Year in recognition of outstanding marketing effectiveness, creativity and execution. Village Park Homes was honored with the most prestigious award of the evening, the 2018 Building Industry Community Spirit Award, where the company was recognized for their dedication and commitment to St. Jude Children’s Research Hospital as the 2018 St. Jude Dream Home builder. The 2018 Dream Home located in The Commons in Richmond Hill, GA, was constructed by Village Park Homes and a group of generous industry partners who donated their time talent and materials, resulting in a historic sold out campaign which raised $660,000 for Pediatric Cancer. The company is continuing the spirit of giving and is currently constructing the 2019 Savannah Area St Jude Dream Home in Rice Hope Plantation in Port Wentworth, GA. Tickets are currently on sale for the 2019 St Jude Dream Home giveaway which will happen live on local NBC affiliate WSAV on June 26th 2019. Village Park Homes is a Bluffton, SC based residential homebuilder and developer currently constructing new homes and town homes in award winning communities throughout coastal SC and GA. The company offers distinctive one and two-story homes ranging from the upper $100’s to over $700,000.